If someone were to ask who the greatest Mets centerfielder was, the answer is simple. However, many Mets fans have a hard time with this. While the answer is so obvious, it is also painful. Without a doubt, it is Carlos Beltran. When you compare him to any other Met that played at least 300 games in center, there is no question that Beltran was the best. We all know the reason for this aversion. On October 19, 2006 Beltran took strike three to end the NLCS. The Mets were the best regular season team in baseball and fell short of the World Series. It was a painful pill to swallow. Even more painful was the fact that it took nine years to return to the playoffs. The 2006 Mets stormed through the regular season. They went 97-65 and were so much better than the rest of the NL. The next best teams were 88-74. The Mets won the NL East by a whopping 12 games and from June on never looked back. Carlos Beltran was without a doubt the best player on that team. He led the Mets in runs scored (127), homers (41), RBI’s (116), WAR (8.2) and OPS (.982). Beltran was the best player on the best team. There are very Mets to ever have comparable seasons. Without this performance, there is no guarantee the Mets would have won the division. Beltran was the best played on an all star team. It wasn’t just that Beltran was the best hitter on the Mets. He was one of the best in the league. He finished second in runs scored and WAR, fourth in slugging fifth in dingers and OPS, seventh in RBI’s and tenth in walks. In addition, he stole 18 bases making him a five-tool player. Beltran ended fourth in MVP voting. Ryan Howard won since the voters overlooked his horrible defense. Right before the postseason, the Mets had two horrible injuries. Neither Pedro Martinez nor Orlando Hernandez pitched in the postseason. They were two of the key pitchers who were needed. While neither had great seasons, the Mets didn’t need them to dominate. All that was needed was to pitch well enough to keep the team in the game and let the bats do damage. In addition, they each had extensive postseason experience, which is invaluable. Without them the Mets had no choice but to use John Maine, Oliver Perez and Steve Trachsel. While the Mets offense was able to bash the Dodgers in the NLDS, the lack of depth showed in the following round. As stated above, the Mets offense was awesome in the first round. In game 1, LA opted to pitch Beltran carefully. He took three walks in that game. He walked once in each of the other games. In the final game Beltran drove in the winning run. Beltran batted 2/9 but with those walks, he was on base half the time. His numbers weren’t overwhelming, but Beltran had a good series. Tom Glavine and Jeff Weaver were both dealing in the opener at Shea. Going into the bottom of the sixth no team even got a runner to third base. That changed when Paul lo Duca hit a two out single and Beltran homered. It would end up being the only runs of the game. Without that swing, it is possible that the Mets may not have won that game… and game 7 may never have happened. The Mets jumped out to an early lead against the Cardinals. After Jose Reyes doubled, Beltran walked to bring up Carlos Delgado. Delgado hit a three-run shot to give the Mets the lead. Unfortunately, Maine was ineffective. He lasted 4 innings giving up 3 earned runs, 6 hits and 4 walks. Nevertheless, the Mets had a lead in the seventh. With two outs, Mota fell apart leading to Scott Spiezio hitting a game tying tripe. In the ninth, the light-hitting So Taguchi homered off Billy Wagner to give the Cards the lead. Wagner gave up two more runs in what would be a crushing loss. Had the Mets pitchers been somewhat effective, they’d have won… and game 7 may never have happened. Down 2-1 in the series, the Mets were desperate. Beltran was as clutch as ever. Trailing by one, Beltran homered in the third. Down by a run in the fifth Beltran got a single with a runner of. The next batter was Delgado, who homered. Beltran walked in the sixth to load the bases before Delgado got another huge hit. In the seventh, Beltran homered again to put the game out of reach. While Delgado got the big hits, Beltran went 3-3 with three walks. Without his effort the Mets might not have won… and game 7 may never have happened. A lockdown bullpen is a postseason necessity. The Mets didn’t have it. The biggest blow to the bullpen came in July when Duaner Sanchez was in a season ending car crash. In the NLCS, the pen just couldn’t hold St. Louis down. As mentioned above, game 2 was lost because of Mota and Wagner. Wagner struggled again in game 6. Heilman gave up the infamous Molina homer in game 7. The presence of Sanchez was missed. In addition, the starters weren’t great. Trachsel got shelled in game 3 and didn’t pitch again. Glavine got knocked out in the fifth inning of game 5. The Mets took game 4 despite Perez getting bashed. Had any of these pitchers gotten the job done, the Mets would have likely won in five or six games… and game 7 may never have happened. Taguchi’s game 2 blast off of Wagner. Losing a series is never the fault of one player. In the NLCS, many key bat didn’t perform. There were two players in particular who underwhelmed. David Wright hit j slashed just .160/.276/.320 from the five hole. Lo Duca was .207/.258/.241 and batted second. Endy Chavez didn’t do much either but he wasn’t a big bat. Before blaming a guy who had a great series, take a long look at those who didn’t show up. Had anyone else stepped up, the Mets could have won by game 6… and game 7 may never have happened. Had the Mets won, the NLCS MVP would likely have gone to Delgado, or it would have been shared by Beltran and Delgado. Beltran slashed .296/.387/.667 while hitting three home runs. Two of them, were very clutch. Delgado had better numbers, but both were monsters. Had Beltran not played well, the Mets would likely have lost in six… and game 7 may never have happened. Molina celebrating the game 7 victory. It is one of the most painful moments in Mets history. To conclude, we need to think rationally. Beltran was the team MVP in 2006. It is unfortunate that the series ended on the curveball from hell. Let’s be honest. Few could have done much with that pitch. Nevertheless, we should recognize the truth. Beltran was one of the greatest Mets ever. He got a megadeal prior to 2005 and lived up to the hype. 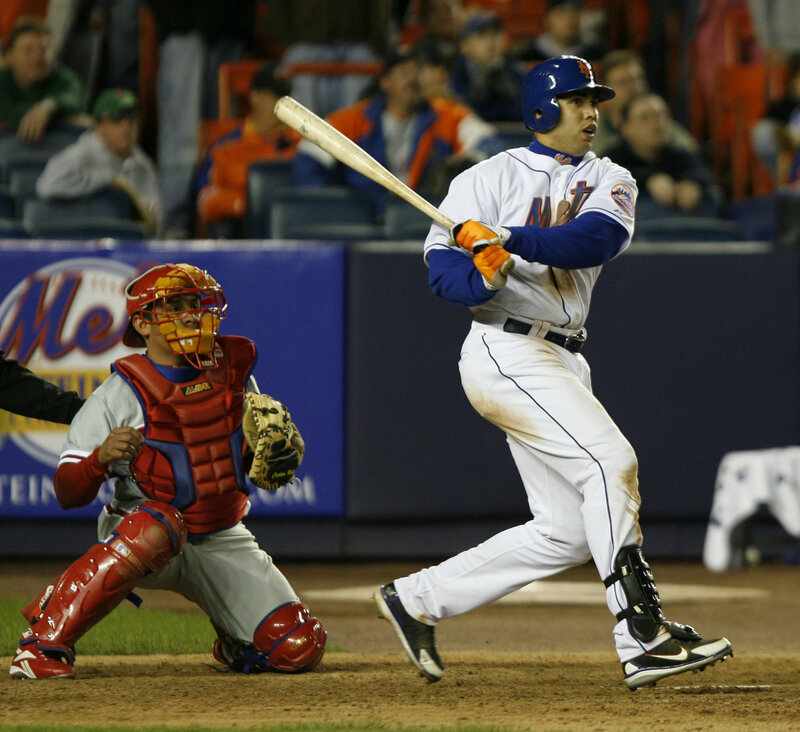 For the rest of his stint in Queens, Beltran was great. Injuries slowed him down at the end, but he always gave it his all. From now on, please do us all a favor and do not let people smear the good name of Carlos Beltran. It was a ball. Terrible call.